My quest to see all the 3 great living Chola temples led me to my second stop at the Airavateeshwar Temple in Darasuram, near Kumbakonam. The Airavateeshwar Temple is dedicated to Lord Shiva. It is believed when Sage Durvasa visited the Gods, the king of God’s Lord Indra himself came to the gates to welcome the Sage. Lord Indra was given a garland of Kalpaka flowers by the Sage, a garland that did not wilt but filled the heavens with its perfume. 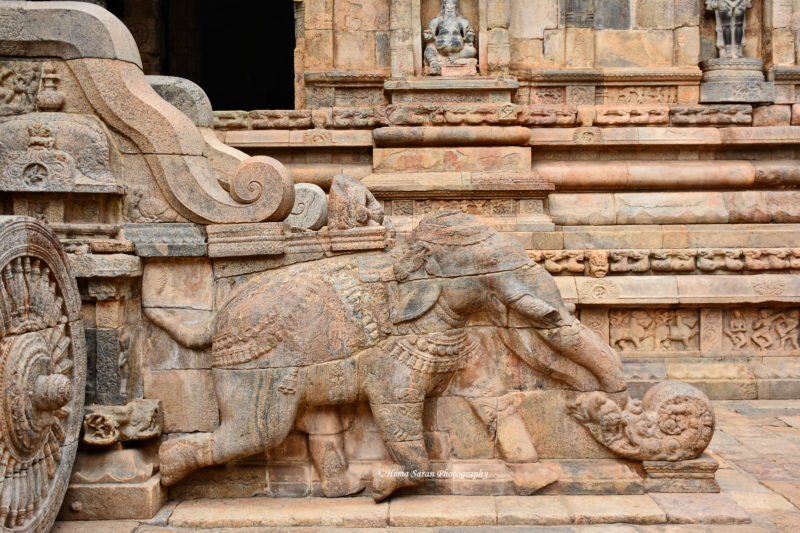 Once the Sage left, Lord Indra thought that the garland would look beautiful on his elephant Airavata. Thinking so, he garlanded his elephant, Airavata, who got irritated by the bees swarming the garland, ripped it away from his neck and threw it down. The news reached the Sage, who cursed the Gods. And he cursed Airavata too, that he will lose the white color and his majestic countenance and will look like an ordinary elephant. Airavata prayed to Lord Shiva in this place and bathed in the sacred waters here to absolve himself of the curse. 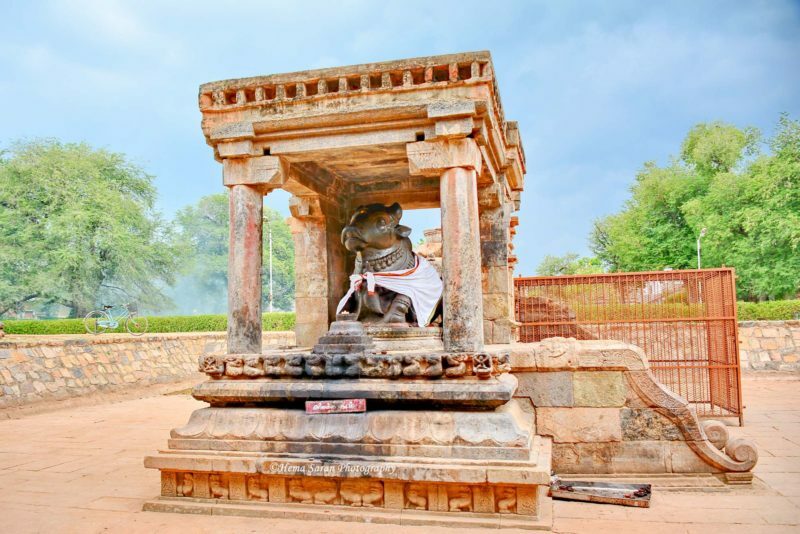 Airavata was cured of the curse and hence the deity of this Temple is known as Airavateeshwara. 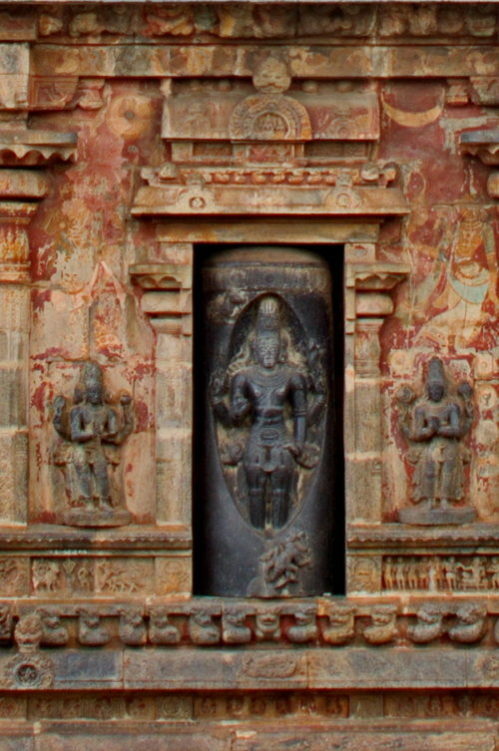 There is a statue of Airavata with Lord Indra seated on top of him in the shrine. Another popular story attached to this Temple is that of Lord Yama, who was cursed by a Rishi . The curse caused him to suffer from burning sensation all over his body. Lord Yama is said to have prayed to Airavateeshwara and bathed in the healing waters of the water tank present in the Temple. The bath cured him of the burning and the water in the water tank came to be known as Yamatheertham. Airavateeshwara Temple was built by Rajaraja Chola II in the 12th century and is part of the Great living Chola temples, a UNESCO heritage site. It is built in typical Dravidian style architecture, primarily found in South India. It features pyramid shaped Vimanas (towers), covered Mandapas (porches) with 108 intricately carved pillars , Gopuras complete with a water tank in the Temple. 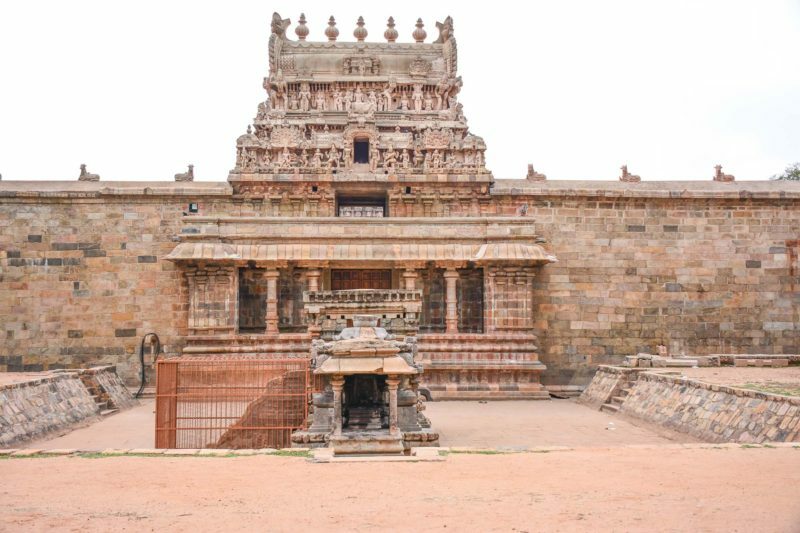 The Airavateeshwara Temple is smaller in size compared to the Big Temple in Tanjore and the Gangaikondacholapuram Temple but has more intricacies in its sculptures. If you enjoy stone art this is a place to be in. I was very much reminded of this temple when I visited Banteay Srei in Cambodia, another small beautiful temple adorned with the most intricate stone carvings. There is a Palipeetha on the Eastern side of the Temple. The palipeetha has few steps on the south side made of stones entirely and striking these steps makes seven musical sounds. They have presently cordoned these steps off permanently with metal grills to protect it. A Nandi shrine follows next and this leads one to the Mahadwara (main entrance). At the Mahadwara there are two imposing figures of the Dwarapalakas, Sankhanidhi and Padmanidhi. After crossing the doorway, one will be standing inside the Temple, looking at the magnificent 24mts/85 ft. Vimana (tower). Once I walked in, I could go straight into the Sanctum Sanctorum. There are no paths created around the Temple to circumambulate the deity. This Mandapam is known as the Rajaghambhiram Thirumandapam. This agra-mandapa in the south side is built like the chariot of Tripuantaka (Manifestation of Lord Shiva) replete with horses pulling the chariot made of wheels with hubs-spokes, all carved intricately on stone. The Temple has sculptures of River Goddesses Cauvery, Ganges, Godavari, Narmada and Yamuna. 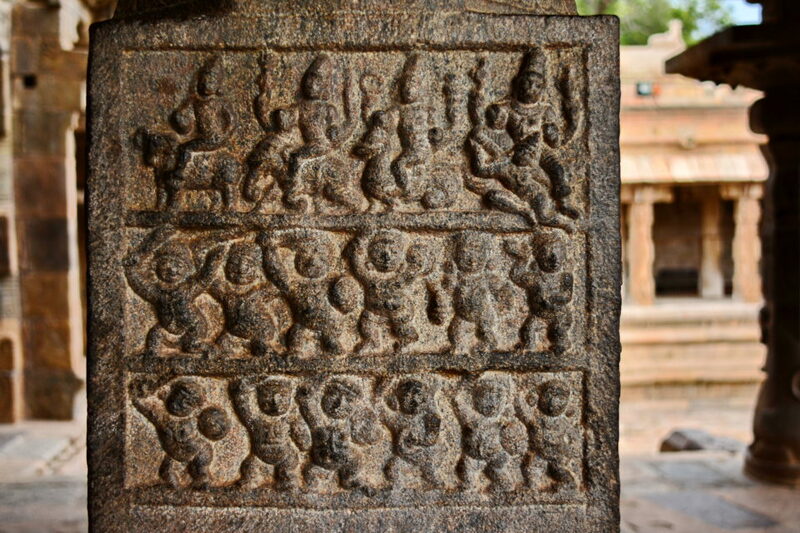 There are also sculptures of celestial nymphs and the Nayanars (Bhakti saints of Shiva) . The pillars are carved with exquisite sequences of Shiva-Parvati marriage and Bharathanatyam poses. 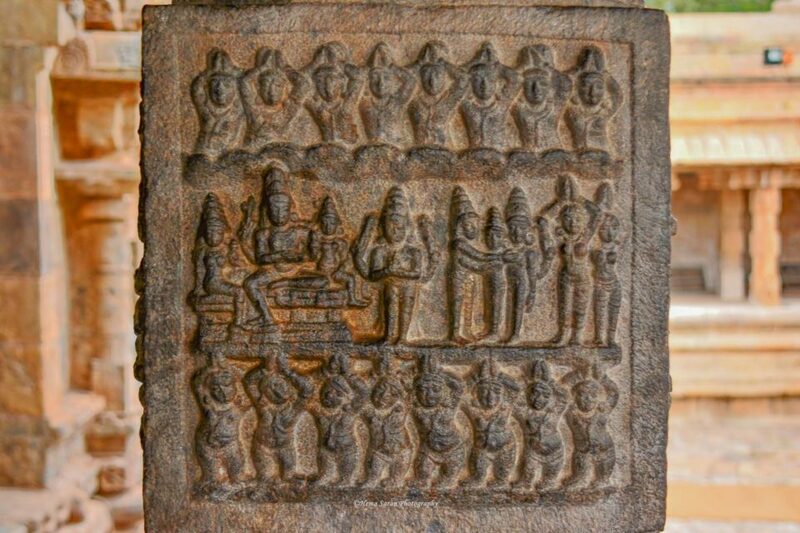 There are many sculptures on the outside of the Temple walls like Ravana carrying Mount Kailasa, a village scene depicting the delivery of a baby, dwarf ganas, women doing yoga . 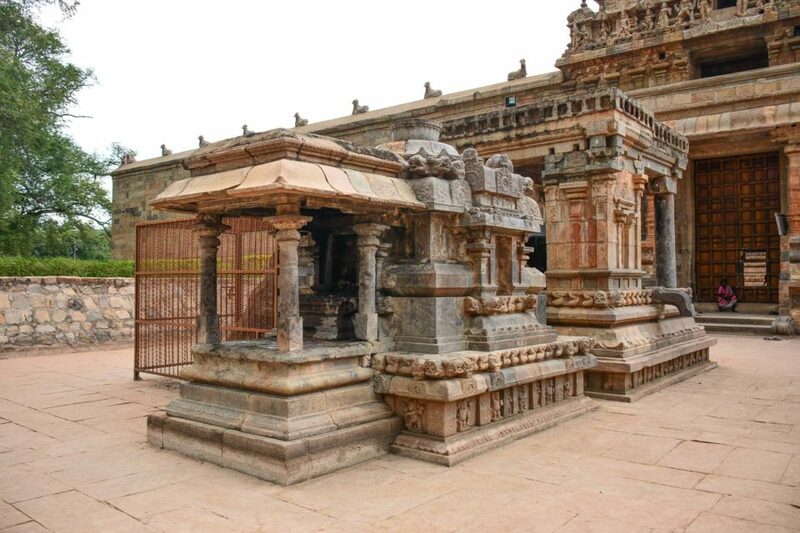 Darasuram Temple was built in a city called Pazhaiyarai and was once the capital of Cholas before Tanjore became the capital . It was known as Rajaraja Puram. It is said that Pazhaiyarai had a 1000 temples and was guarded on all four directions by military camps. If you love stone sculpture this is a dream world entirely made of stone art. Darasuram Temple is in the outskirts of Kumbakonam. It is 3 kms from the heart of Kumbakonam city and is 36 kms from Tanjore. There are passenger trains that come to Darasuram. You can take a bus to Kumbakonam City and then change to a minibus from Kumbakonam bus station to get to Darasuram Temple. 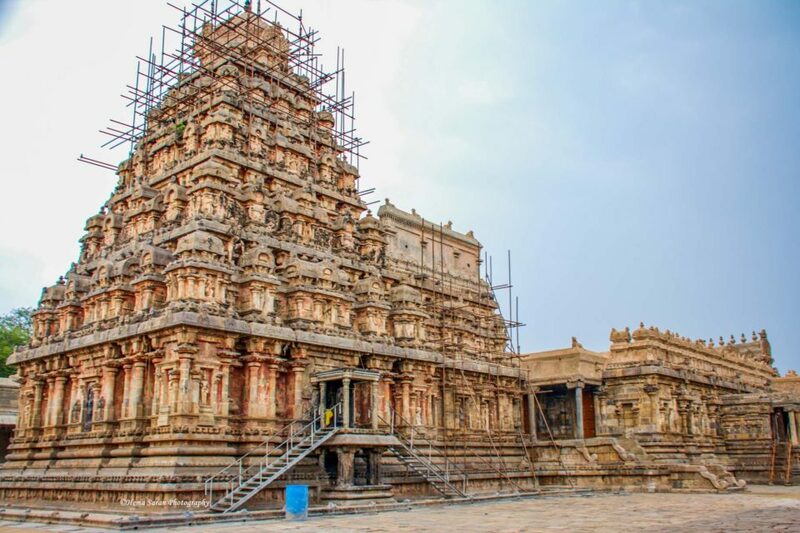 This temple is a replica of the Tanjore big temple but only smaller in size. 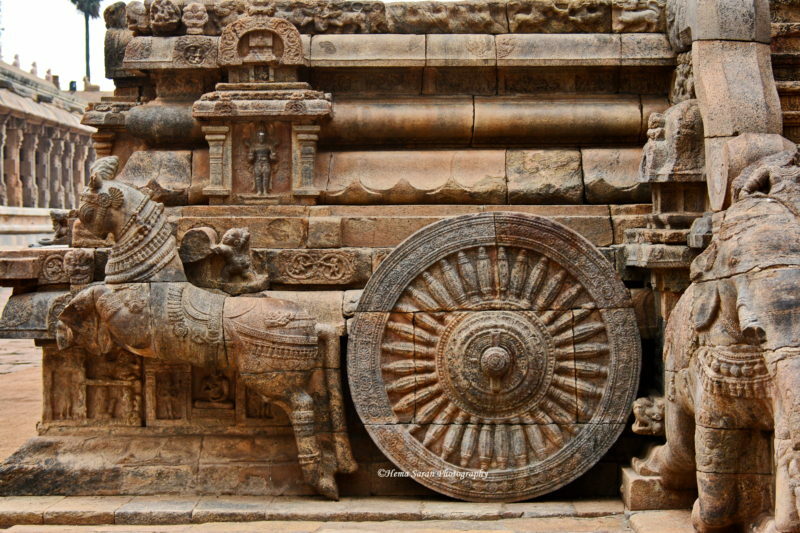 The Airavateeshwara Temple was the inspiration behind the Konark temple Chariot mandapas in Puri. 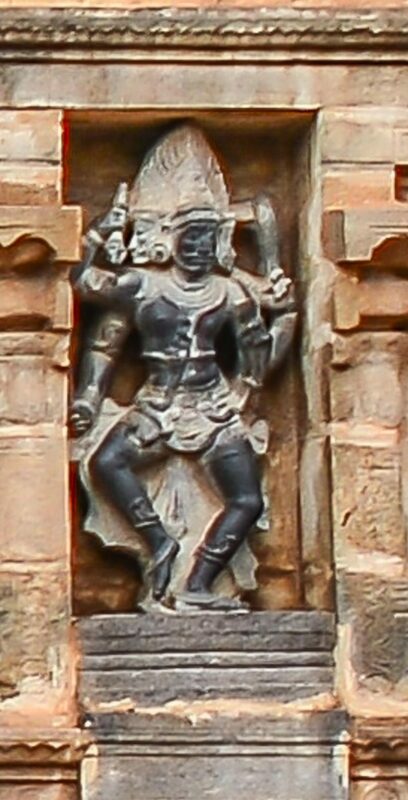 Narasimha Deva I, son of the King Ananga Bhima III, a relative of Kullothunga Chola I, built the Konark Temple.